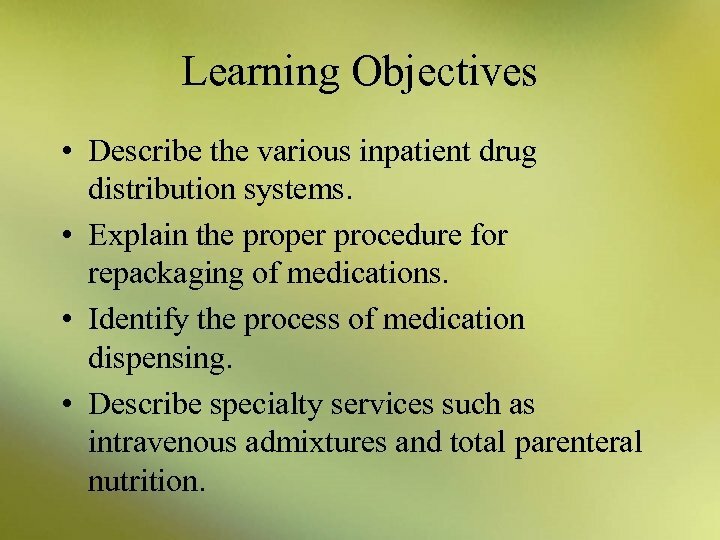 Learning Objectives • Describe the various inpatient drug distribution systems. • Explain the proper procedure for repackaging of medications. • Identify the process of medication dispensing. 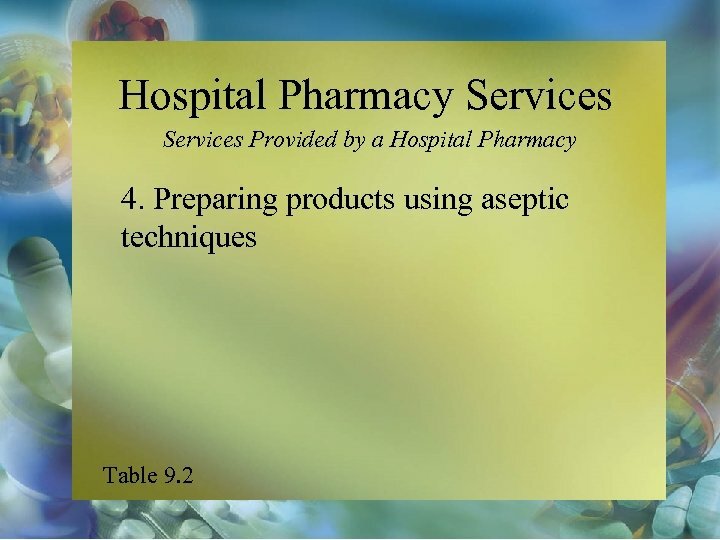 • Describe specialty services such as intravenous admixtures and total parenteral nutrition. 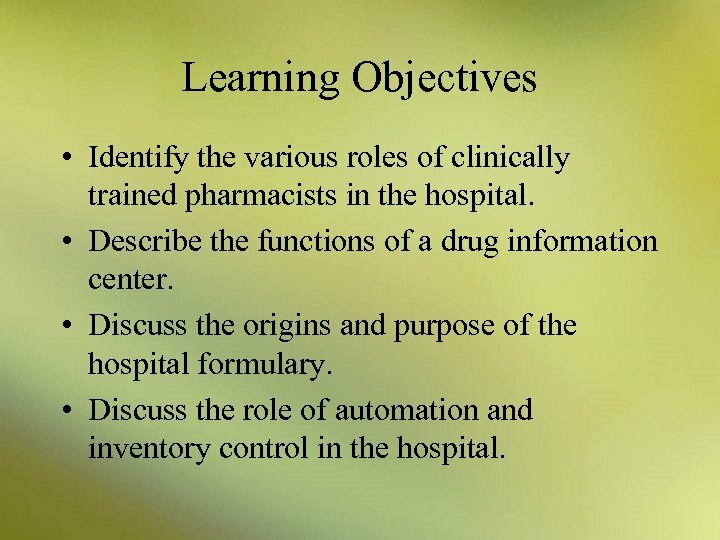 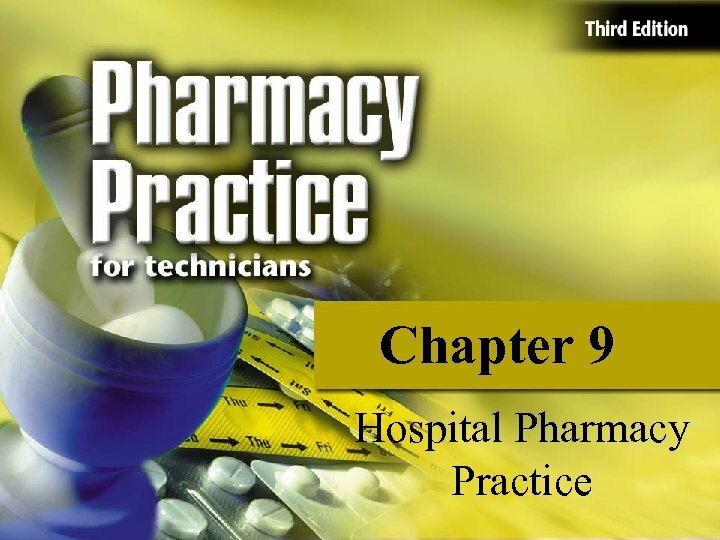 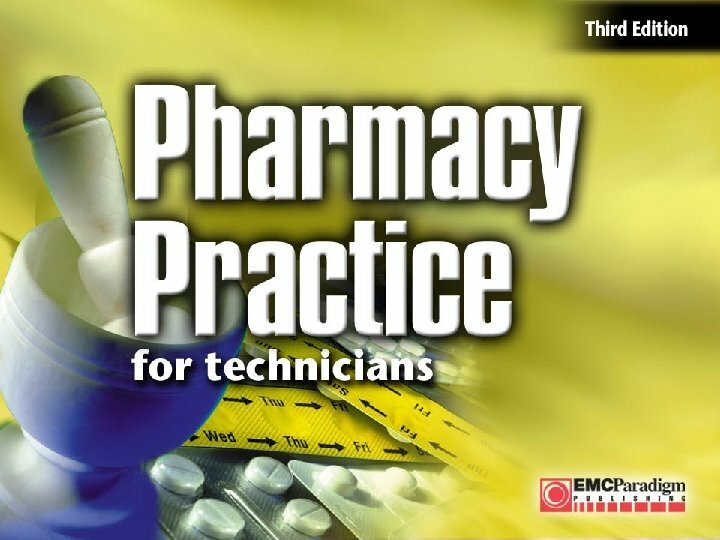 Learning Objectives • Identify the various roles of clinically trained pharmacists in the hospital. • Describe the functions of a drug information center. • Discuss the origins and purpose of the hospital formulary. • Discuss the role of automation and inventory control in the hospital. 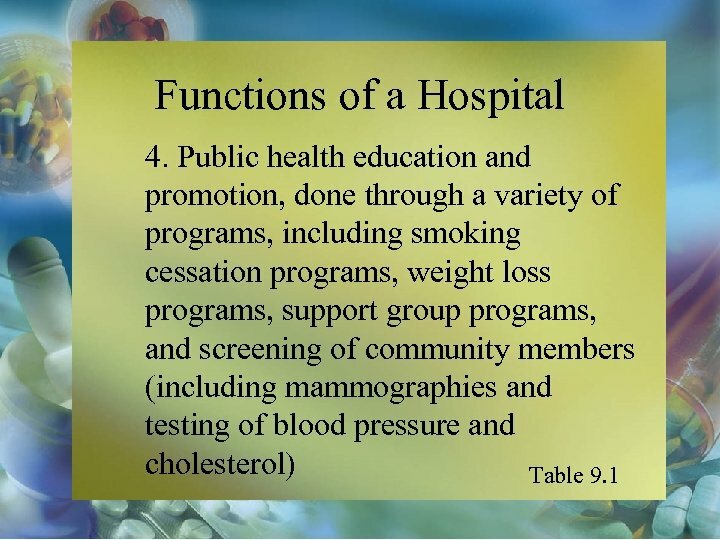 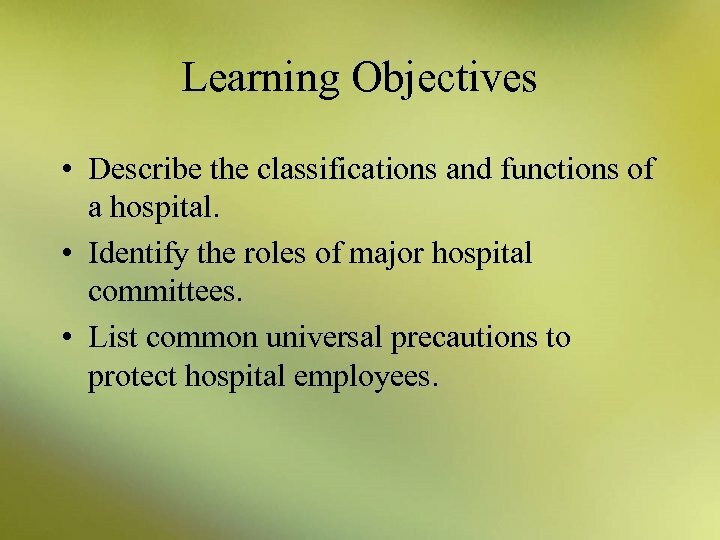 Learning Objectives • Describe the classifications and functions of a hospital. • Identify the roles of major hospital committees. 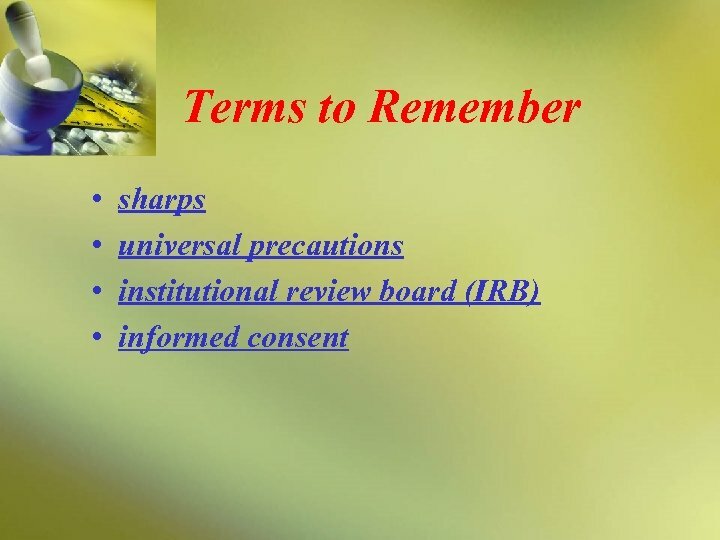 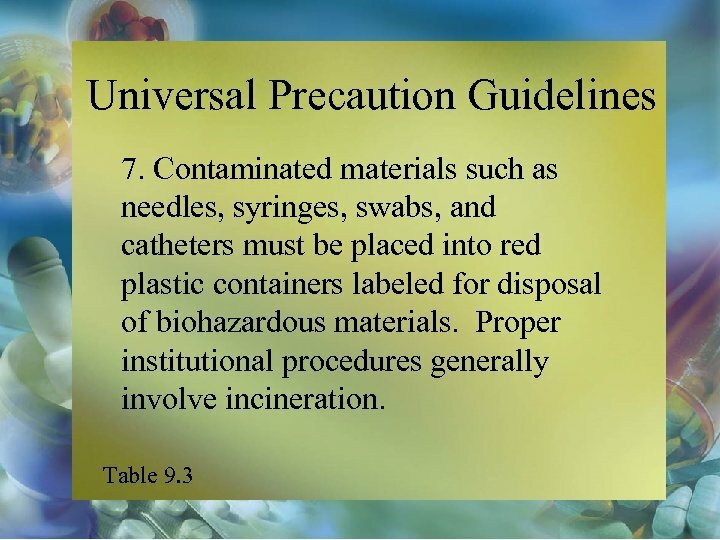 • List common universal precautions to protect hospital employees. 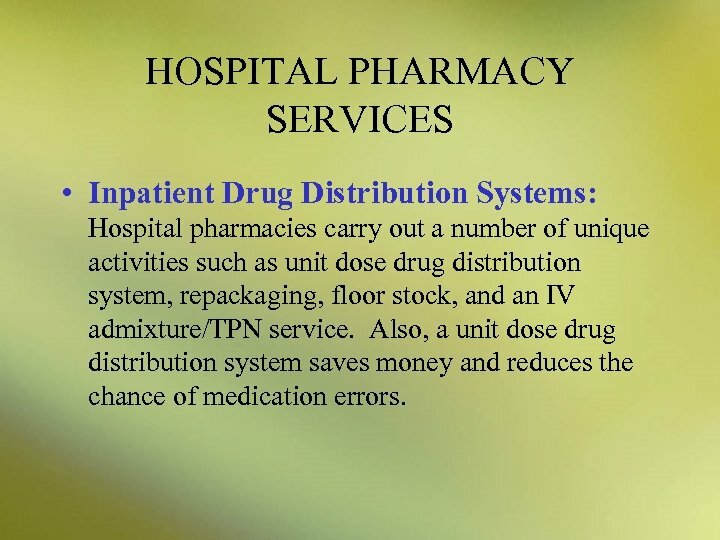 HOSPITAL PHARMACY SERVICES • Inpatient Drug Distribution Systems: Hospital pharmacies carry out a number of unique activities such as unit dose drug distribution system, repackaging, floor stock, and an IV admixture/TPN service. Also, a unit dose drug distribution system saves money and reduces the chance of medication errors. Hospital Pharmacy Issues Safety Note! 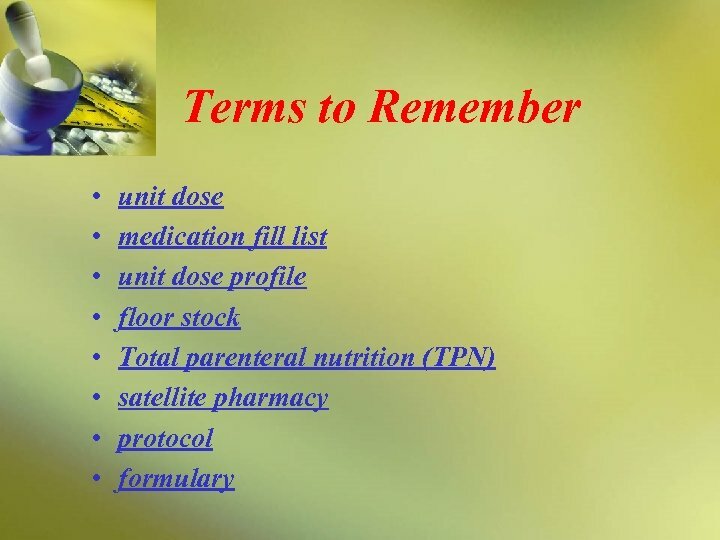 • Only unopened unit doses can be returned to stock. Hospital Pharmacy Issues Safety Note! • As in the community pharmacy, in the hospital pharmacy the technician works under the direct supervision of the pharmacist. HOSPITAL PHARMACY SERVICES • Clinical Services: Many hospitals offer clinical and consultative services such as nutrition support, pharmacokinetics, critical care, and other specialties. • Drug Information Services: Most hospitals have a drug information service that is primarily responsible for making recommendations on a drug formulary. 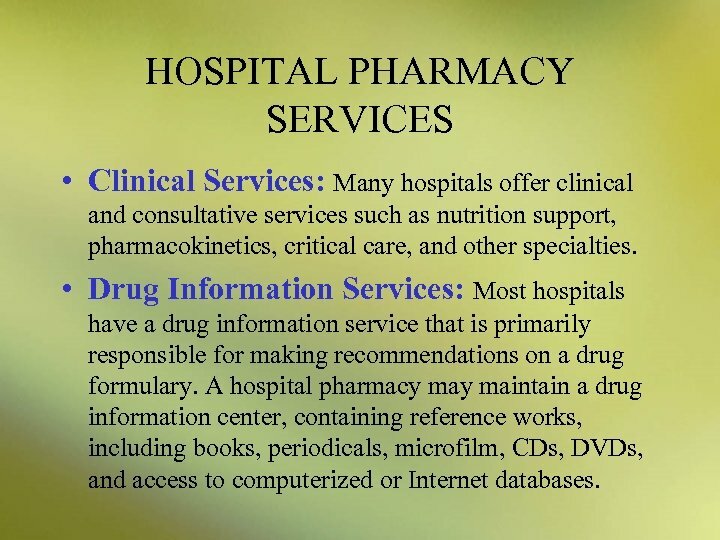 A hospital pharmacy maintain a drug information center, containing reference works, including books, periodicals, microfilm, CDs, DVDs, and access to computerized or Internet databases. 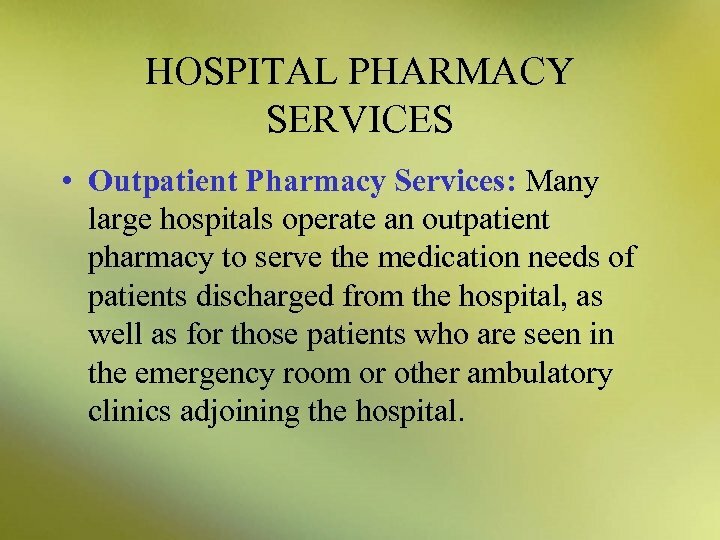 HOSPITAL PHARMACY SERVICES • Outpatient Pharmacy Services: Many large hospitals operate an outpatient pharmacy to serve the medication needs of patients discharged from the hospital, as well as for those patients who are seen in the emergency room or other ambulatory clinics adjoining the hospital. Hospital Pharmacy Issues Safety Note! • All computer systems must protect patient privacy. Hospital Pharmacy Issues Safety Note! 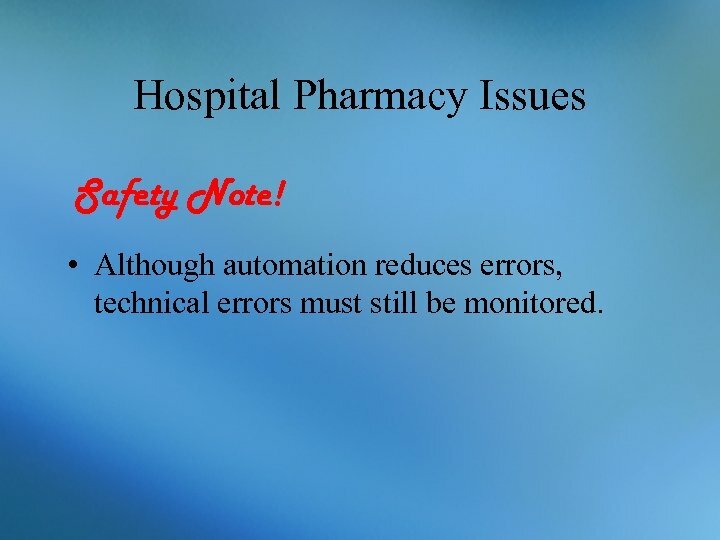 • Although automation reduces errors, technical errors must still be monitored. 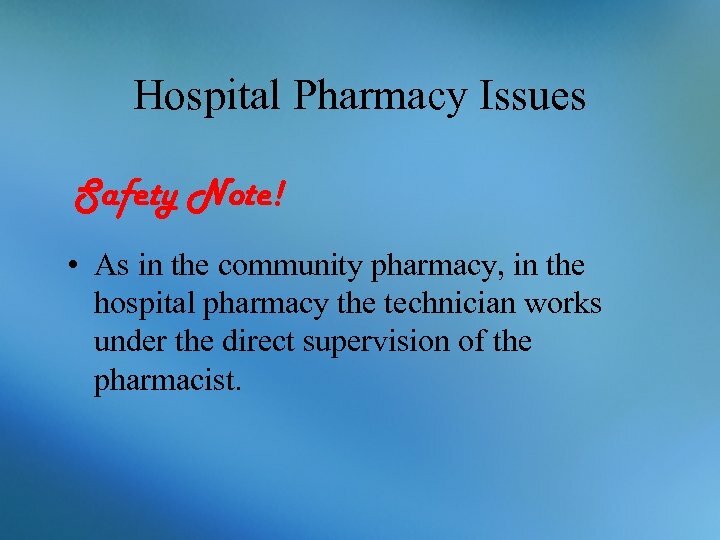 Hospital Pharmacy Issues Safety Note! 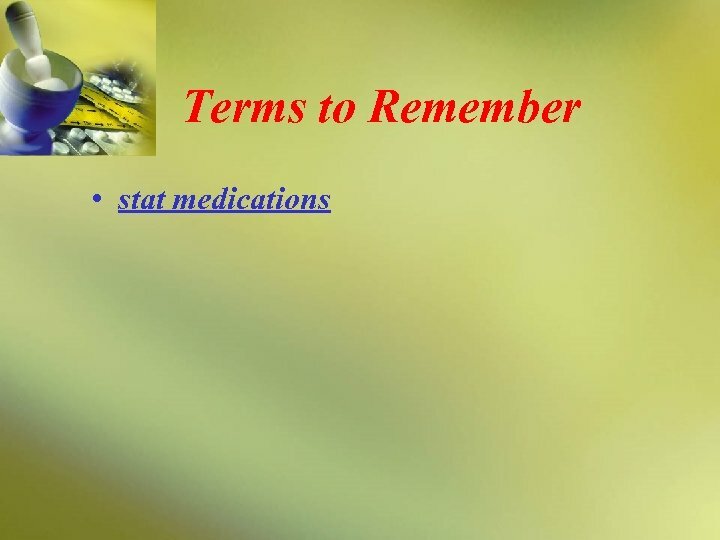 • Expiration dates must be included on all repackaged medications. 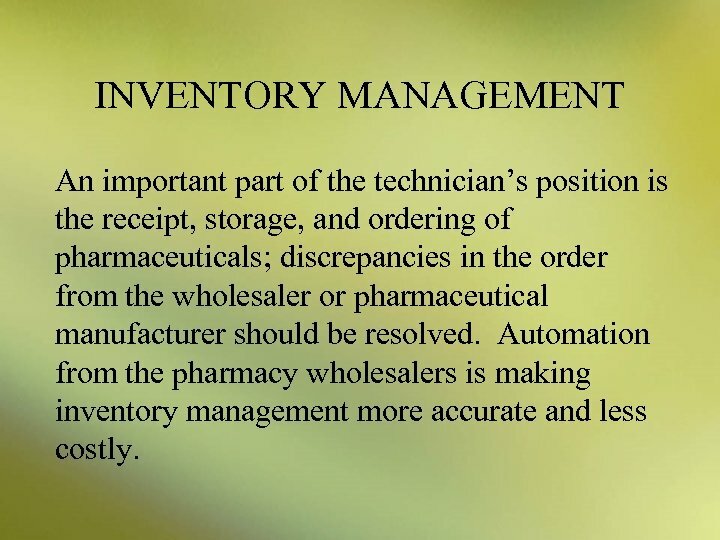 INVENTORY MANAGEMENT An important part of the technician’s position is the receipt, storage, and ordering of pharmaceuticals; discrepancies in the order from the wholesaler or pharmaceutical manufacturer should be resolved. 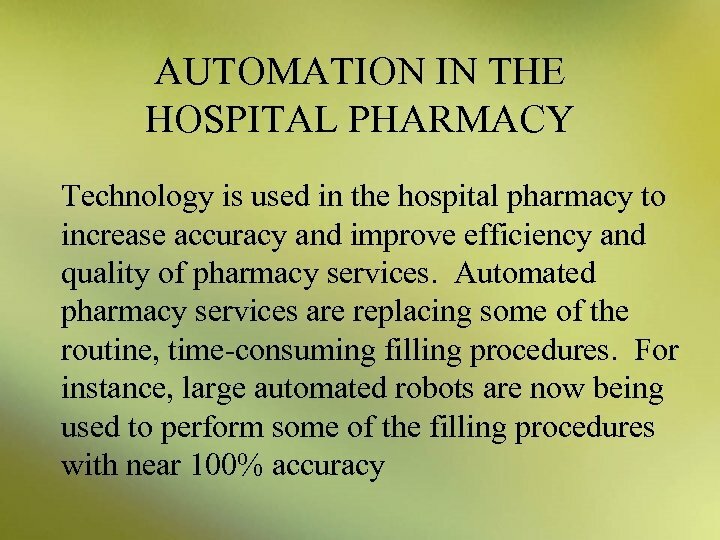 Automation from the pharmacy wholesalers is making inventory management more accurate and less costly. 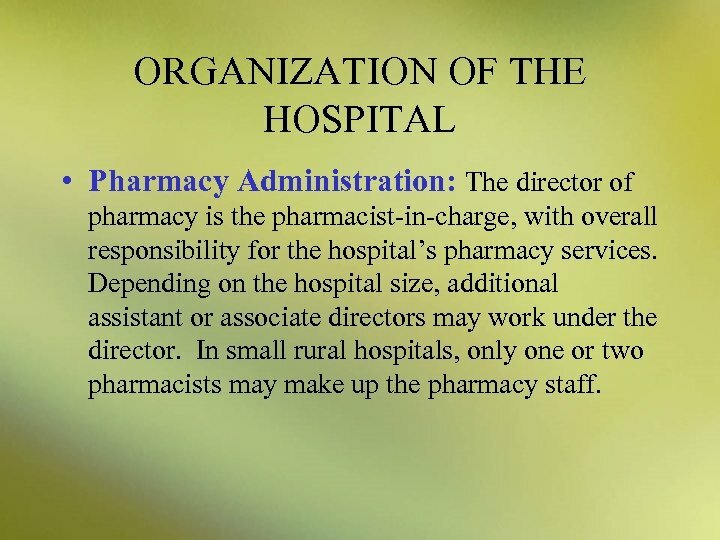 ORGANIZATION OF THE HOSPITAL • Pharmacy Administration: The director of pharmacy is the pharmacist-in-charge, with overall responsibility for the hospital’s pharmacy services. 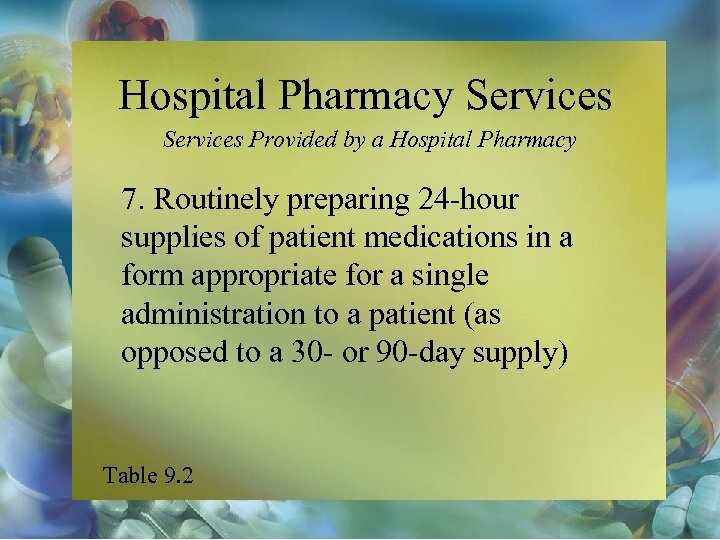 Depending on the hospital size, additional assistant or associate directors may work under the director. In small rural hospitals, only one or two pharmacists may make up the pharmacy staff. 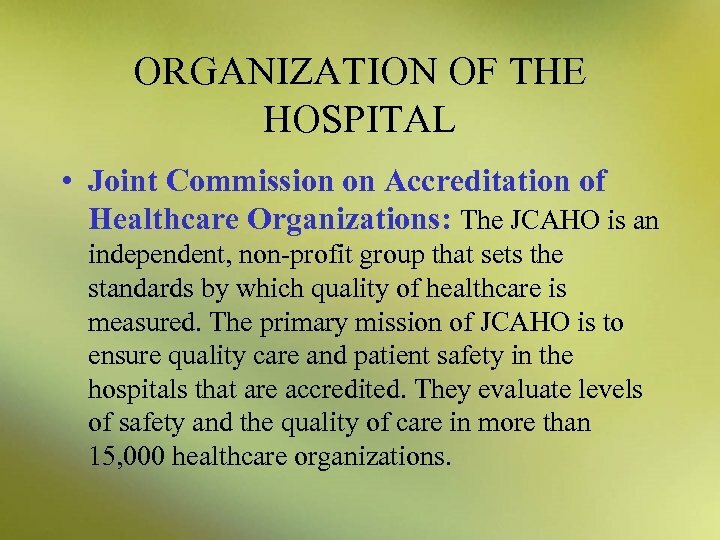 ORGANIZATION OF THE HOSPITAL • Joint Commission on Accreditation of Healthcare Organizations: The JCAHO is an independent, non-profit group that sets the standards by which quality of healthcare is measured. 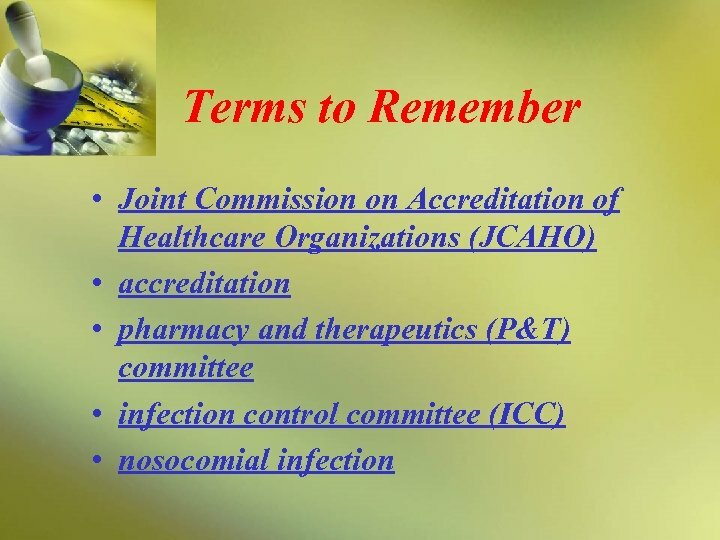 The primary mission of JCAHO is to ensure quality care and patient safety in the hospitals that are accredited. They evaluate levels of safety and the quality of care in more than 15, 000 healthcare organizations. 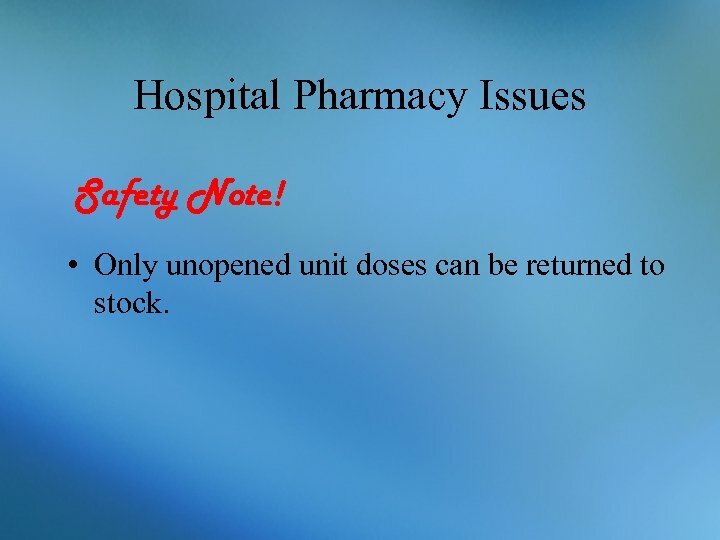 Hospital Pharmacy Issues Safety Note! • Almost 50% of JCAHO standards relate directly to safety. ORGANIZATION OF THE HOSPITAL • Pharmacy and Therapeutics Committee: The P&T committee is primarily responsible for making the final decision on drug formulary decisions. 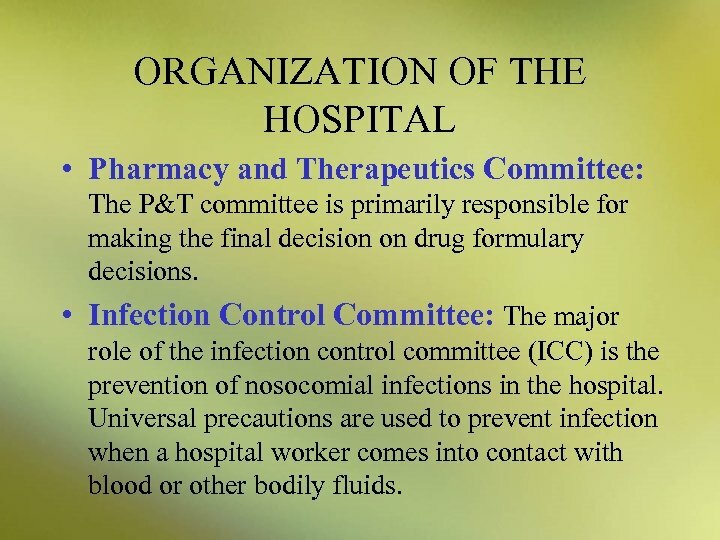 • Infection Control Committee: The major role of the infection control committee (ICC) is the prevention of nosocomial infections in the hospital. 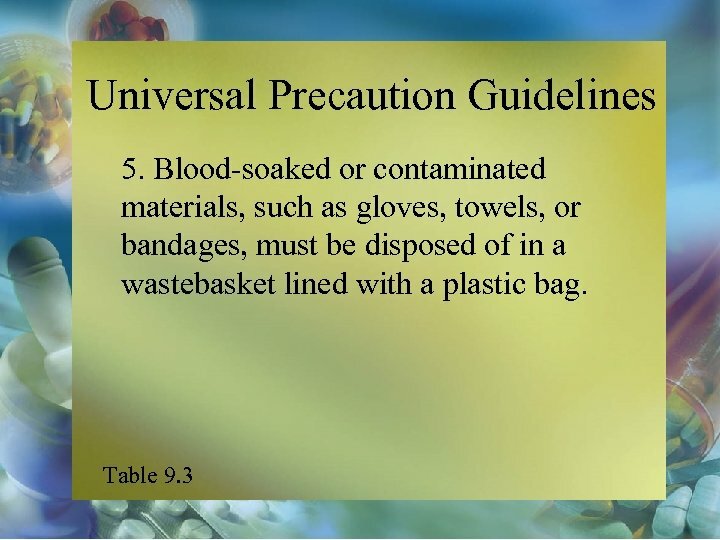 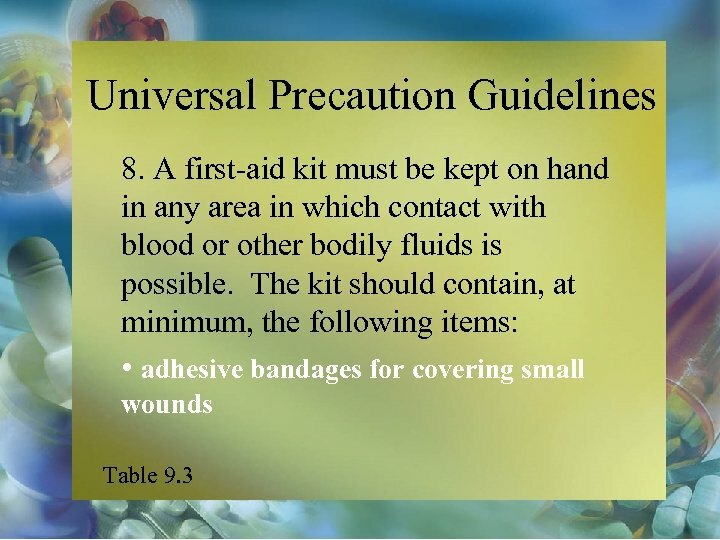 Universal precautions are used to prevent infection when a hospital worker comes into contact with blood or other bodily fluids. 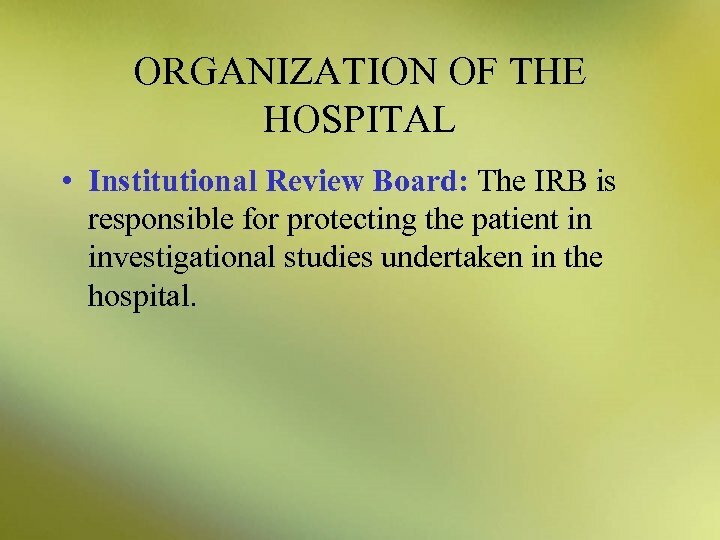 ORGANIZATION OF THE HOSPITAL • Institutional Review Board: The IRB is responsible for protecting the patient in investigational studies undertaken in the hospital. 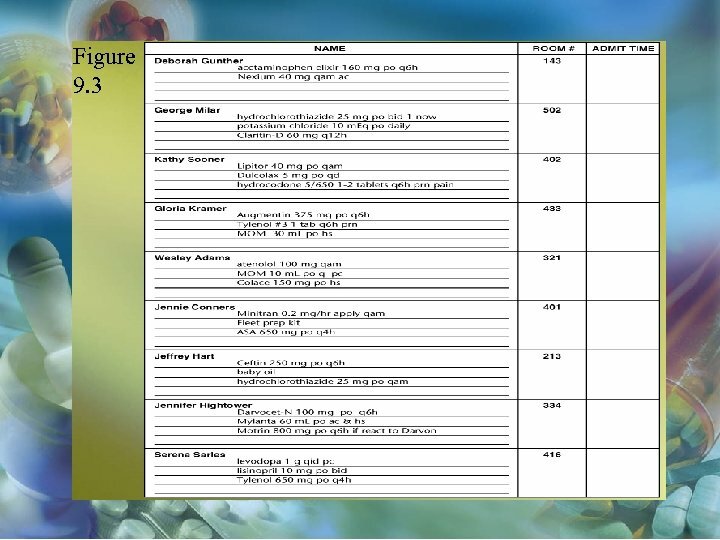 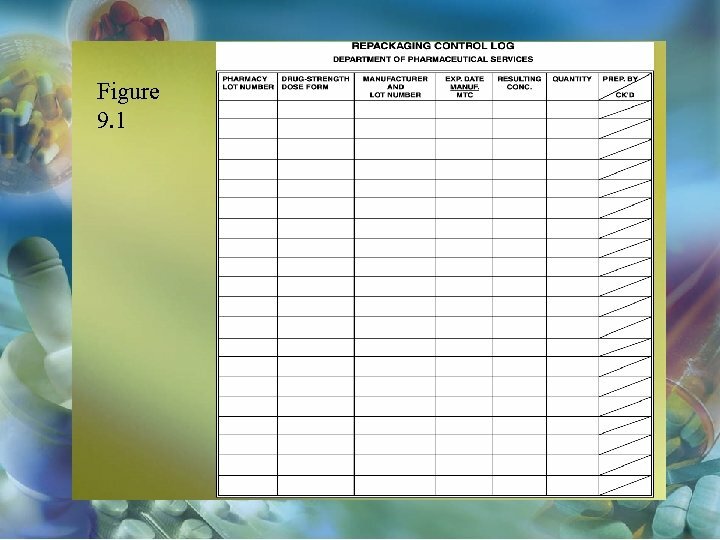 Discussion Write out a complete description, not using abbreviations, of the medication orders given in Figure 9. 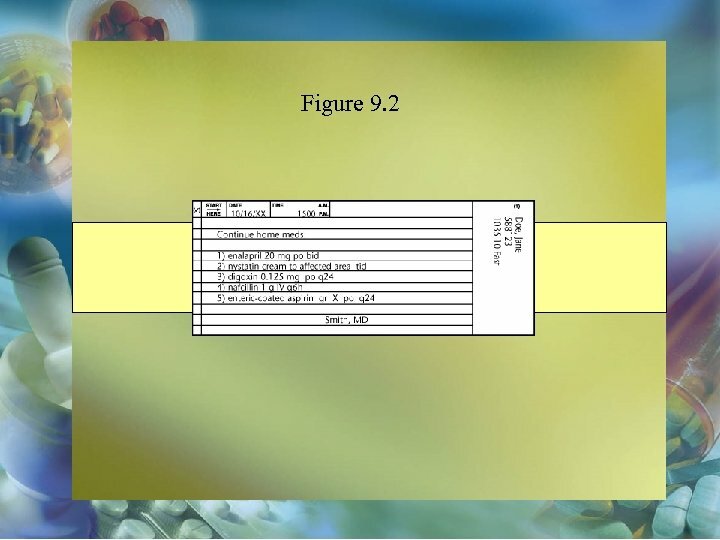 2 and Figure 9. 3.